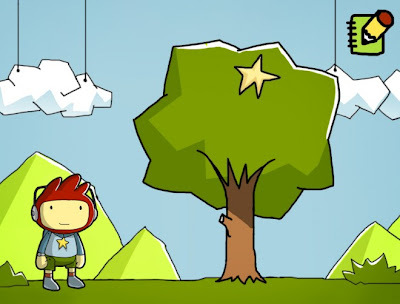 Scribblenauts is great for the first couple of hours. You can type in almost anything you can imagine, and a representation of that object will appear on the screen for you to interact with. The number of words that the in-game dictionary recognizes is stunning. Unfortunately, playing around with the dictionary may be the only really fun part of the game. Past the first few levels, the seams begin to show and then quickly unravel. The movement of your avatar is tied to the Nintendo DS stylus, causing him to throw himself into spikes just as often as selecting a usable item. This gets frustrating quickly, and could have easily been solved by using the DS buttons for movement. Solving puzzles using all the items available to you should lead to a lot of eureka moments, but the objects interact in very limited ways. In one puzzle, when I was trying to move a cow so some cars could get by, I had the brilliant idea of using a shrink ray to shrink the cow, and then hiding it in a briefcase so that a nearby butcher wouldn’t see him. Unfortunately, the tiny cow wouldn’t go in the briefcase. (What? That was a reasonable solution.) Most puzzles ended up boiling down to just attaching something to a rope and a helicopter and moving it somewhere else. It’s disappointing that a game with one great mechanic failed to deliver a great game to surround it. Borderlands comes from the Voltron school of game design: take several winning ideas from other games and properties, combine them into one unstoppable game/robot, and then publish. 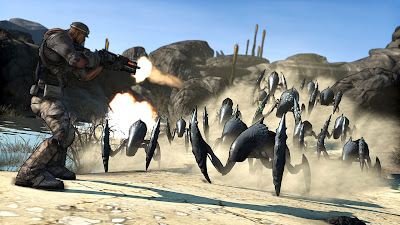 It is essentially the setting of Firefly or Mad Max with the regenerating shield of Halo, the shooting mechanics of Call of Duty: Modern Warfare and the leveling and random loot system of Diablo 2 and World of Warcraft. The only thing that sets the game apart is that no one has ever made a combination quite like that before. Despite the lack of originality, those elements combine to make a fun, addictive experience that we can’t seem to shut up about.